Our pure Cashmere Capes lined with satin/polyester lining are expertly woven into lusciously soft and deliciously warm cashmere. (Only black color cape does not have lining and buttons)Woven from some of the finest cashmere hairs in the world these capes are truly elegant, sophisticated yet practical. Aside from the versatility of such a wonderful accessory, it is offered at a fraction of the price. Comparable cashmere capes are unbelievably expensive. Undoubtedly, this cape will give elegant finishing touch to any outfit. It can be easily worn every day layered over a jacket/coat or as a cape over slacks and suits. Of course it is just as stunning as a wrap over evening clothes! These capes are chic with its complete satin lining which ultimately gives it an extra luxurious feel. These capes are clearly one of the best accessory items that can any woman would want because it is not only luxurious, it is the perfect choice for those times when a sweater, wrap or coats is too much or not enough. Our capes transform any outfit and are exceptionally fashionable, fun and easy to wear. They make the perfect thoughtful yet stylish gift. One size fits all! These capes are available in six (6) vibrant colors like- Classic Black, Camel, Navy, Coffee, Ivory and Wine. 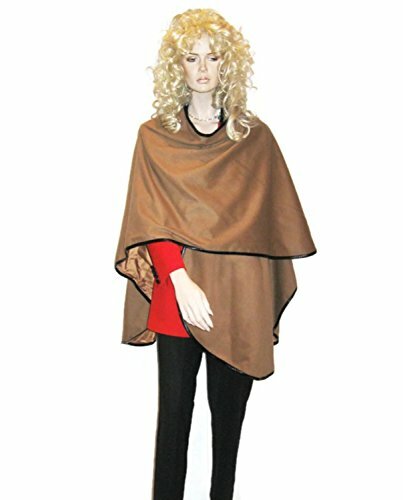 • This Cashmere fabric used to make these capes is (three) 3-Ply thick which makes the cape luxuriously soft and warm. The cape is 'One size fits all'. The length of cape is 33 inches (from the nape of the neck to the bottom of the cape) and this cape has the sumptuous all around circumference of 102 inches. • This pure cashmere cape is a great accessory that can easily replace sweaters, wraps and coats. Our capes transform any outfit and can be worn loosely or one side draped over the shoulder. Capes are very fashionable and are fun and easy to wear. It makes the perfect gift-thoughtful, stylish and one size fits all! • This is the perfect gift and one of the best accessories any woman could own, especially for fashion savvy.